Will Pensioner Bonds Election Bribe Lift General UK Savings Interest Rates from Catastrophic Lows? The recent news for the extension of the Coalition Government's 4% Pensioner Bonds election bribe for a further 3 months to at least Mid May 2015 looks set to soak up at least £25 billion of the savings held by interest rate starved pensioners at an estimated cost to the tax payer of at least £1.2 billion. Whilst the bond is only open to the over 65's, nevertheless it will result in a flow of funds away from the commercial banks and to the government run NS&I that should prompt at least a limited rise in savings interest rates, especially for the directly competing fixed rate bonds such as the 3 and 4 year bonds that could now nudge above 3%. The 4% Government bond may mark the start for the end or for a pause in Britain's savings catastrophe as a consequence of the banking crime syndicate suckling on the teat of the Bank of England for over 6 years now through a myriad of schemes (scams) that results in effectively providing the banks with unlimited funding that has resulted in the collapse of savings interest rates the latest phase of which began in May 2012 and has in large part been kept at sub inflation rates that amounts to systemic theft. The table below illustrates the cash ISA rates offered by apparently the often reported on as best buy accounts of the Halifax mega-bank that in reality crashed in response to the Bank of England's Funding for Lending Scheme that started in July 2012. The table shows that the tax payer bailed out Halifax continues to across the board pay abysmally poor rates of interest that compare against average RPI inflation rate of 2.4% for 2014. Therefore the Halifax, along with most banks should by May 2015 have at least marginally raised their savings interest rates from the current catastrophic lows. For instance the Halifax 5 year ISA awful rate of of 2% should be at least back to the marginally less awful rate of 2.2%. Though the bankster crime syndicate of other countries such as that of Denmark are laying the ground work to start charging customers interest on funds deposited at their banks - NEGATIVE INTEREST RATES! 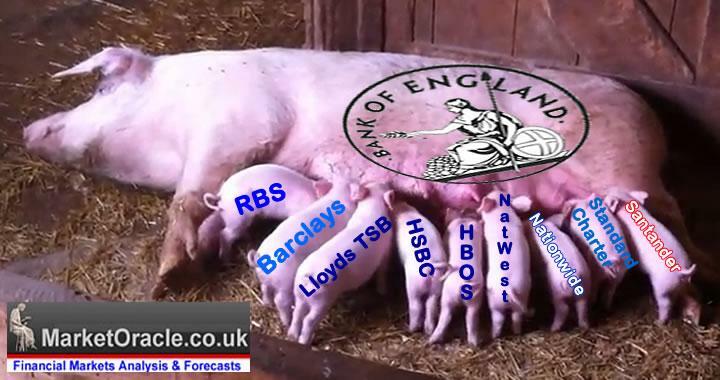 Where banks go from real terms theft of customer deposits purchasing power to outright theft of funds on deposit. Negative interest rates are as a direct consequence of central bank rampant money printing, flooding the financial system with free money that destroys purchasing power of currency, destroys the value of savings, destroys investment and instead encourages casino capitalism with borrowed free money that ofcourse stokes housing bubbles. Savers What to do ? In my opinion savers either continue to effectively hand over their hard earned cash to the banks to systematically siphon off through persistent loss of purchasing power or they look at alternative asset classes such as the UK housing market that is currently trundling along at an average annual percentage rate of THREE times the pittance that the likes of Halifax pays as covered at length in my UK Housing Market Ebook available for FREE DOWNLOAD (Only requirement is a valid email address).